More than nine-in-ten Hispanics identify with a specific religion. 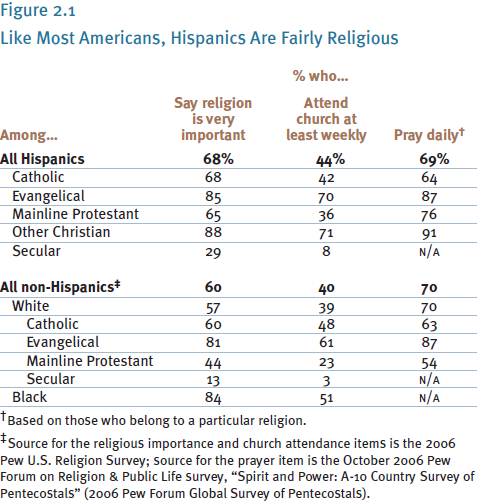 That, along with several other measures of belief and behavior, means that Hispanics as a group are highly religious. How does this affinity for spirituality vary among Latinos with different demographic characteristics or religious affiliations? And how precisely do the religious beliefs of Latinos set them apart from the rest of the population? For the great majority of Latinos, regardless of their religious tradition, God is an active force in daily life. Most Latinos pray every day, most have a crucifix or other religious object in their home and most attend a religious service at least once a month. 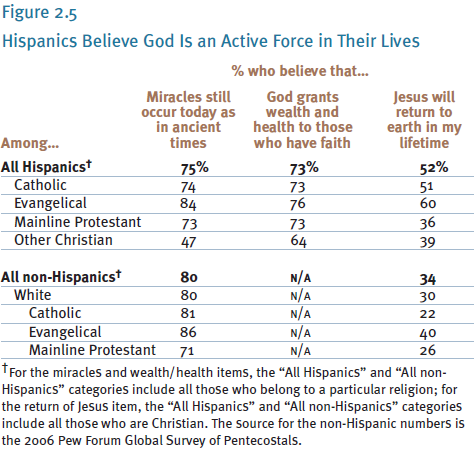 By significant majorities, Latinos who identify with a religion believe that miracles are performed today just as they were in ancient times and that true believers are rewarded with health and wealth. In some ways, Hispanics as a group are no different than the rest of the U.S. population, which by and large is also fairly religious. But in other ways, Latinos appear to be different, both in the intensity of their beliefs and in how they practice those beliefs. Sometimes it is a question of degree: Latinos are somewhat more likely than non-Hispanics to say that religion is very important in their lives. Sometimes the difference is within religious traditions: Almost half of Latino Catholics — more than twice the rate of white Catholics — say the Bible is the literal word of God. And sometimes the difference centers on a core belief: More than the public as a whole, Latinos who are religious largely subscribe to the belief that Jesus will return to Earth in their lifetime. That teaching is common among Protestant proponents of rapture theology, which posits that the faithful will be rescued and taken to heaven before the world comes to an end. Religious beliefs and practices vary among Latinos, and especially between Catholics and evangelicals. Evangelicals pray more, they attend religious services more frequently, they are more avid readers of the Bible and they evangelize — or share their faith with nonbelievers — more than do other Latinos. These differences at times extend to core beliefs. For example, Latino Catholics are very devoted to the Virgin Mary, while Latino evangelicals are far less so. Most evangelicals hold that the Bible is literally true, word for word; while many Catholics agree, they are not nearly as likely to believe this. There are also differences in how religion is practiced in everyday life. Latinos who are evangelicals take part in prayer groups and read the Bible far more regularly than do those who are Catholics, for instance. For their part, Latino Catholics are more likely than are Latino evangelicals to display religious objects in their home and to pray directly to the saints or to the Virgin Mary. These differences are not in and of themselves measures of religious commitment; they may instead reflect different traditions of spirituality. This chapter examines Hispanic religious practices and beliefs across different religious traditions, with comparisons to non-Hispanics. It looks at the frequency of attendance at religious services, which is an important indicator of overall religious commitment, as well as how religious beliefs and practices vary among different demographic segments of the Latino population. 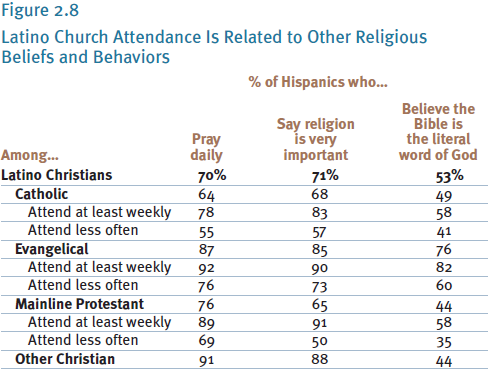 Finally, there is a separate discussion of how Hispanics view different religious groups. Among Latinos, significant majorities of Catholics (68%) and mainline Protestants (65%) say religion is very important to them. The percentages are higher still among evangelical Protestants (85%) and other Christians (88%). These figures are somewhat higher than among non-Hispanics. More than four-in-ten (44%) Hispanics say they attend religious services at least once a week, and 63% attend at least monthly. Non-Hispanics report church attendance at similar levels. Here again, however, there are substantial differences across religious traditions. While 70% of Latino evangelicals say they attend church at least once a week, attendance rates are much lower among Latino Catholics (42%) and mainline Protestants (36%). Conversely, 28% of Latino Catholics say they attend church “a few times a year or seldom,” compared with 14% of evangelicals. 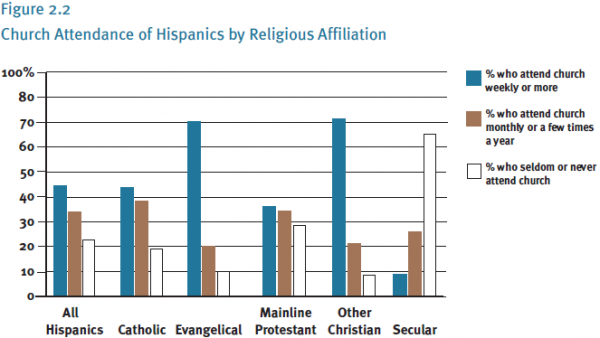 In this regard, however, Latinos are not substantially different from non-Hispanics of the same religious tradition. There is a similar pattern when it comes to private prayer. Nearly seven-in-ten (69%) Hispanics say they pray every day. But daily prayer tends to be even more common among Latino evangelicals (87%) than it is among mainline Protestants (76%) and Catholics (64%). Again, the same patterns are evident among non-Hispanics of different religious traditions. While several religious practices are common to all Hispanics regardless of religious tradition, other behaviors are more tradition-specific. For instance, participation in prayer groups, Bible study groups and other small religious meetings are quite common among Latino evangelicals (75% participate in such groups at least once a month). By contrast, such practices are much less common among Latino Catholics and mainline Protestants; among these groups, fewer than half (31% and 47%, respectively) participate in such activities at least once a month. The same generally holds true for two other religious activities: Bible reading and evangelism. More than three-quarters of Latino evangelicals (78%) read the Scriptures at least once a week, while only 38% of Latinos who are mainline Protestants and 27% of Latino Catholics do so. And about eight-in-ten Latino evangelicals (79%) evangelize at least once a month. Latinos who are mainline Protestants and Catholics, on the other hand, are much more reticent when it comes to spreading their faith. Overall, Hispanics participate in these activities at rates roughly comparable to those seen among members of the same religious traditions in the general population. 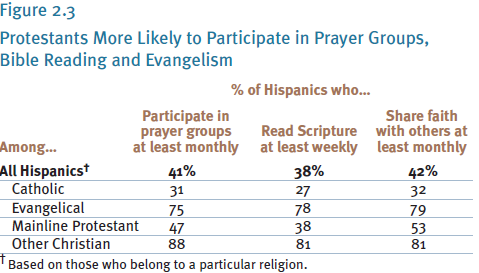 Hispanic evangelicals, however, participate in prayer groups and share their faith with others at somewhat higher rates than do their non-Hispanic counterparts. Some religious practices are more common among Catholics than among other religious groups, reflecting both the distinctive natures of Protestant and Catholic spirituality and theological differences between the two traditions. 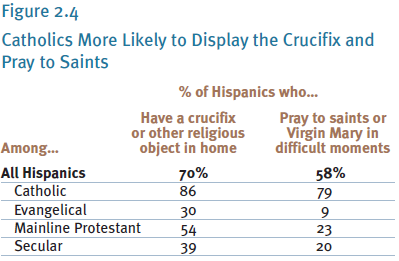 For instance, Latino Catholics are far more likely (86%) than any other group to display a crucifix or other religious object in their home; only three-in-ten Latino evangelicals (30%) do so. Nearly eight-inten Catholics (79%) say that they pray to saints or to the Virgin Mary during difficult moments in their lives. By contrast, only 9% of Latino evangelicals and 23% of mainline Protestants acknowledge praying to saints in times of trouble. A large majority of Hispanics believe that God is actively involved in the world. Among those who identify with a religion, three-in-four say that miracles still occur today just as in ancient times. This belief is held by significant majorities of Latino Catholics, evangelicals and mainline Protestants. Regardless of religious tradition, Latinos also largely subscribe to views sometimes described as the prosperity gospel, the belief that God rewards the faithful with physical well-being and financial prosperity in this life. About three-in-four Latino Catholics, evangelicals and mainline Protestants subscribe to this view. Roughly half of all Hispanic Christians (52%) also believe that Jesus will return to Earth in their lifetime. This belief is most common among Latino evangelicals (60%), but it is strong even among Catholics (51%). In this regard, Latinos are very different from non-Hispanic Christians; only about one-in-three non-Hispanic Christians, including 40% of white evangelicals and 22% of white Catholics, believe that Jesus will return during their lifetime. One of the most significant differences between Catholics and Protestants concerns their widely disparate views of the Virgin Mary, a central figure for Catholics generally and especially for Hispanic Catholics. 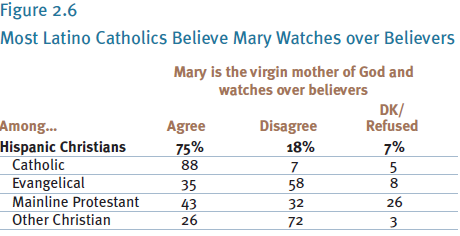 Belief that Mary is the mother of God and that she watches over believers is very common among Latino Catholics (88% agree). Though rarer, the belief also is espoused by some Latino Protestants even though many Protestant churches have traditionally discouraged the kind of devotion to Mary practiced by Catholics. About four-in-ten (43%) Latinos who are mainline Protestants and one-in-three evangelicals (35%) agree with this belief. However, a significant majority (58%) of Latino evangelical Protestants disagree. If devotion to the Virgin Mary sets Catholics apart from other Hispanics, belief in the literal truth of the Bible distinguishes Latino evangelicals from other groups. 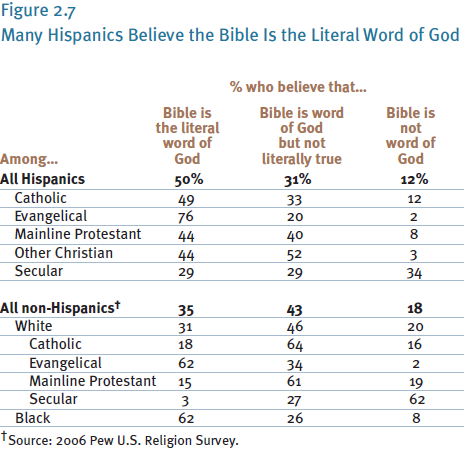 More than three-quarters of Latino evangelicals say the Bible is the word of God and is to be taken literally, word for word. 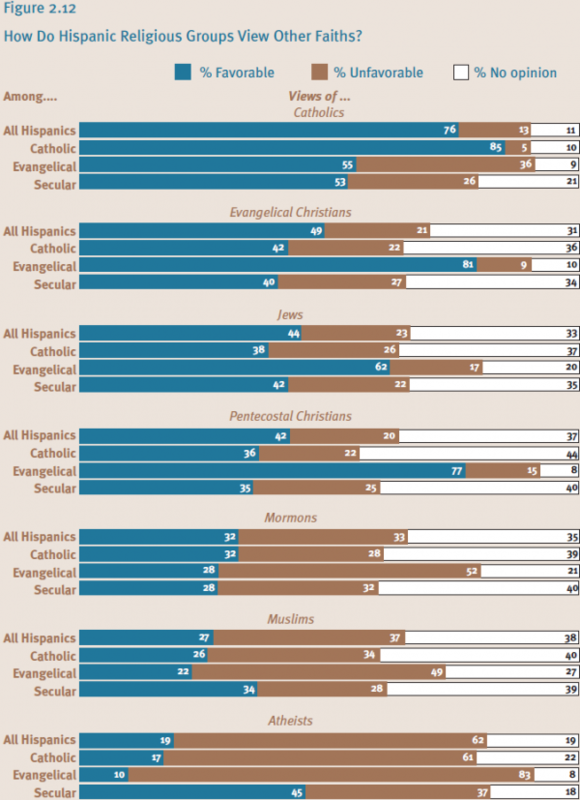 Among Latino Catholics and other Christians, by contrast, fewer than half hold that view. Although Hispanic Catholics are less likely than evangelicals to view the Bible as literally true, they still stand out compared with non-Latino Catholics. Among Latino Catholics, for example, 49% interpret the Bible as literally true, a much higher figure than among non-Hispanic Catholics, only 18% of whom share this view. Religious tradition is not the only factor shaping religious practices and beliefs and influencing social values and political attitudes. Research confirms that the level of religious commitment also plays a major role. A simple but effective measure of religious commitment is attendance at religious services. Frequency of church attendance is closely related to several other measures of religious practice and, as such, serves as a good indicator of religious commitment. Across all three major Christian traditions, for instance, Latinos who attend church at least weekly are much more likely to pray on a daily basis than are those who attend church less often. They also are more likely to say that the Bible is the word of God and is to be interpreted literally, word for word. Similarly, those who attend church on a weekly basis are much more likely than are others to say that religion is very important in their own lives. Similar patterns are found among non- Hispanics. The frequency of church attendance also has been shown to be closely related to social and political attitudes in the general population. Indeed, a Pew analysis of the results of the 2004 presidential election revealed that frequency of church attendance was one of the most important factors shaping a person’s decision in that election.1 In Chapter 6, we will examine patterns of church attendance to better understand the relationship between religion and politics in the Hispanic population. country of origin. Central Americans, for instance, stand out for the importance they place on religion as well as for their high levels of church attendance. Cubans, by contrast, are less religious than are other Hispanics by these measures. Language is another important variable. Among Latinos whose primary language is Spanish, for instance, 75% view religion as very important in their daily lives; that is much higher than among Latinos whose primary language is English (59%). Those who are Spanish dominant overwhelmingly agree (83%) that God will grant financial success and good health to believers, whereas among those who are English dominant only a slight majority (54%) agree. Those whose primary language is Spanish also are far more likely to say that Jesus will return to Earth in their lifetime than those whose primary language is English (60% vs. 43%). Demographic factors are important influences on a variety of religious beliefs and practices, but statistical analysis also reveals that even after these demographic factors are taken into account, religious tradition and church attendance appear to play a significant role in shaping various religious beliefs and practices. In short, both demographic factors and the specifics of religious tradition are closely associated with specific religious beliefs and practices among Hispanics. In the study, Latino evangelicals report that they receive services from and volunteer with church groups at higher levels than do Latino Catholics. In response to questions on whether they received help finding a job or housing or in dealing with financial problems, for instance, Latino evangelicals respond more positively than do Catholics by significant margins. Similarly, evangelicals are much more likely to say they received help from their churches with child care and in finding food or clothing. Services on language and literacy training, an important resource for many immigrants, are available at about the same rate at Catholic, evangelical and mainline Protestant churches. Latino evangelicals also are more than twice as likely as Latino Catholics to say they volunteer with a church group. When it comes to other kinds of activities, such as volunteering for a school or neighborhood group, the differences are much smaller, however. This suggests that although Latino Catholics and evangelicals may not be so different in their general orientation toward volunteerism, evangelical churches themselves are a focal point for this kind of activity. Fewer than half of Latino Catholics hold favorable views of other religious traditions. In contrast, majorities of Latino evangelicals voice favorable views of Catholics, Jews, evangelicals and pentecostal Christians. Muslims and Mormons, however, are viewed favorably by only small shares of Latinos, regardless of religious tradition. The same is true for atheists. When it comes to Jews, attitudes are starkly different by religious tradition. Among Latino Catholics, only 38% have favorable views of Jews, compared with 62% of Latino evangelicals. Latino evangelicals also hold very favorable views of pentecostal Christians. These higher favorability ratings among evangelicals may reflect the importance of Israel and the Jewish people in evangelical theology, and the fact that many Latino evangelicals are themselves pentecostal Christians. Views of Mormons and Muslims, on the other hand, are split or tend to the negative. Only about a third of Latinos (32%) say they hold favorable views of Mormons, with an equal number (33%) expressing unfavorable views. Muslims, too, are viewed rather unfavorably, with roughly a fourth of Hispanics (27%) expressing favorable views, compared with 37% expressing unfavorable views. Latinos feel more unfavorably toward atheists than they do toward any other group. The negative view prevails by more than a 3-to-1 ratio (62% unfavorable, 19% favorable). Pew polling from July 2005 allows for a comparison between the views of Latinos and those of the general population on these favorability measures. Opinions of Catholics are very similar (76% of Hispanics have a favorable view of Catholics, compared with 73% among the general public, according to the 2005 survey). Other groups, by contrast, are viewed less favorably by Hispanics than by the public as a whole. Latinos, for instance, are much less likely than the public as a whole to express a favorable view of Jews (44% vs. 77%) and are more likely as well to express an unfavorable view of Jews (23% vs. 7%). Evangelicals also are viewed less favorably by Hispanics than by the general population (49% vs. 57%). According to a May 2006 Pew survey, Muslims also receive a higher favorability rating from the public as a whole than from Hispanics (54% vs. 27%). Although atheists also receive the lowest favorability rating among the general population, Latinos are considerably more negative. The favorability rating of atheists is nearly twice as high among the general population (35%) as among Hispanics (19%).